I have been getting this question a lot recently : What is the difference between a wedding planner and a venue coordinator? If you are looking to have your big day at a full service wedding venue, more often than not there’s a venue coordinator who will be there. Although both titles may similar, in reality, it is immensely different. In a nutshell, a venue coordinator’s job description has its boundaries while a wedding planner’s duties are next to unlimited. Here is a breakdown. Venue coordinators are paid employees of the venue. Their responsibilities include highlighting the venue, providing a preferred list of vendors, working with you on the room layout, formalizing your catering needs, and processing the final invoice. They also ensure all venue employees are aware of your wedding plans from the set up team to the chef to the cleaning crew. Their focus is making sure things are executed based on what their contract says in setting up the layout of the room correctly, having the food out in a punctual manner and taking down the set up at the end of the night. Often times, the venue coordinator leaves once meals are served at the reception, or when cake is cut. The venue coordinator may or may not help you with your wedding rehearsal or wedding day timeline. It is also rare for one to design or decorate the reception. Cuing the DJ for the first dance, lining everyone up for the exit, and the details of a wedding are usually outside the scope the venue coordinator’s responsibilities. Ultimately, the venue coordinator is there to represent their property but not necessarily the bride and groom. It is also important to note that although you might have worked with a specific venue coordinator throughout your planning process, there is no guarantee that same person will be there on your wedding day since some venues have multiple receptions going on simultaneously. In contrast, the wedding planner works for the bride and groom, therefore he/she represents your wishes. The wedding planner is there every, single step of the way from the initial planning stages i.e. visiting venue options with you and reviewing contracts to wedding day preparation from conducting a rehearsal to confirming details with other contracted vendors. The wedding planner ensures that you get what your venue’s contracts states along with what ALL your other vendors promised to deliver (cake, DJ, stationary, etc.). This also goes for “Day/ Month of Wedding Coordinator” personally hired by you. While they may appear a month out before the event date, they work exclusively for you! We are concerned with whether you are keeping with your timeline so you don’t go over your allotted time and incur additional charges. If you need help reviewing contracts, we are there. If there are any questions from other vendors like the photographer or videographer, we have an answer. If you see stars from all the Pinterest board ideas out there, we are your voice of reason. If your dress has a rip, we have a sewing kit handy. We are there so you, your family and friends can truly enjoy one of the most special days in your life. Think of us as your very own project manager, in charge of your entire wedding. We are also your mediator, an objective point of view, friend or a shoulder to lean on. 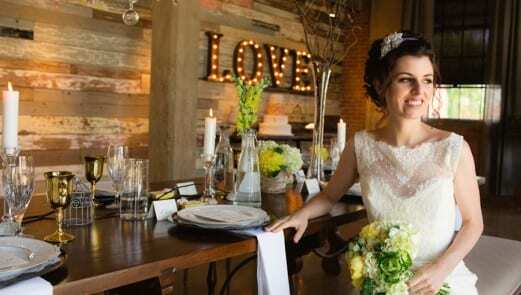 A lot of individual attention is given to a bride and groom since a boutique wedding planning company might deal with 15 weddings a year while a venue and its coordinators easily do three times that amount. *Tip: Almost every venue has a Preferred Vendor List. It is crucial to ask if vendors on the list had to PAY to be listed. The other day, I received a phone call from a venue asking if I wanted to pay X amount to be a preferred vendor. I had never heard of them before, nor did they know anything about my work. It was strictly about business. That being said, not all venues do this but it is always important to check so you have quality vendors. On the other hand, no one pays to be on Keestone Event’s preferred list, nor do we pay for any vendor lists. I recommend vendors I have worked with who have proven themselves to be professional, prompt, reliable and deliver fantastic work. That being said, when some venue coordinators tell brides that wedding planners are not necessary, it is infuriating! I know of a bride who decided to go on this route to save some money because she had a venue coordinator at a hotel. The venue coordinator did not show up to her wedding even once throughout the night, and things ran waaaay over time. In such situations, you really do get what you pay for. This post was not written to bash venue coordinators. We at Keestone Events love working with venue coordinators, and some of our most memorable weddings have had remarkable venue coordinators working tirelessly at the back-of-the-house to pull things together there. There are some truly wonderful venue coordinators out there who are so valuable to the wedding planning process. These people are a joy to work with and it makes things so much more effortless when you have two coordinators working both sides of the spectrum, all for one wedding. That way, no stone is left unturned and no crack is visible. It is imperative that couples really understand though what they are getting into and the description that comes with each title to avoid frustration and disappointment!